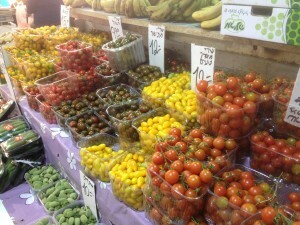 Almost all produce in Israel is locally grown, and thus seasonal. Over the past year, plus, I have created a calendar of when foods first become available at Jerusalem’s Machane Yehuda Market. The calendar below (click pictures for larger images) just marks when the seasons begin. Some produce stays in season for a long time, some very short. The calendar below is approximate, and I will try to update. It is not comprehensive, but comes close. After the monthly calendar, I also list the produce alphabetically, so you can search to find out when something specific comes into season. Some produce in Israel is available (more or less) the whole year, either due to different varietals, greenhouse cultivation or storage. And there is a small portion of imported produce, also lengthening seasons. Even though these fruits and vegetables are always available, there are still better times to buy them. For example, apples are better in fall and early winter, citrus fruits and root vegetables in winter, tomatoes in late spring/early summer, etc. Apples, Bell Peppers, Broccoli, Cabbage, Cauliflower, Celery, Chili Peppers, Citrus Fruits, Cucumbers, Eggplants, Fennel, Garlic (dried), Grapes, Lettuce, Melons (they sell many varieties, all simply sold as “melon,” that ripen throughout the year), Mushrooms, Onions, Potatoes, Radishes, Scallions, Summer Squash (normal dark-green zucchini isn’t always available, but other varieties are), Tomatoes. Citrus fruits (oranges, lemons, clementines, grapefruits) are starting to hit their prime. Root vegetables starting to get large.